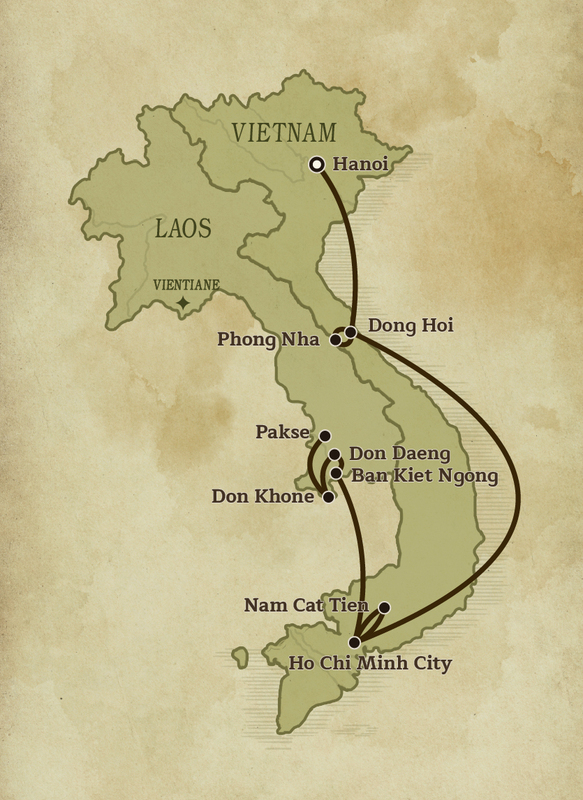 Adventure abounds on this all-action journey through some of Vietnam and southern Laos’ most naturally beautiful and fascinating areas – experienced by trekking, cycling, motorbiking, climbing and caving. 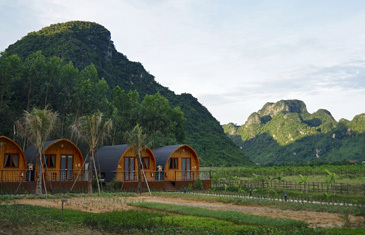 Nom is a quaint, two-century-old village that remains little unchanged and a quintessential northern Vietnamese village. We explore the local market and lakeside pagoda and while cycling along red brick streets, glimpse ancient village architecture, which includes a finely carved arched gate and an uncommon stone bridge. Stopping off at a traditional ancient house to meet a local family allows us to learn more about Nom’s age-old village culture and traditions. We head north of Hanoi on motorbike to reach 300-year-old Duong Lam Village, renowned for its traditional wooden houses and Ba Vi National Park, an area of outstanding natural beauty. Ascending the Park’s three-peaked mountain reveals breathtaking panoramic views and an 11th century shrine. 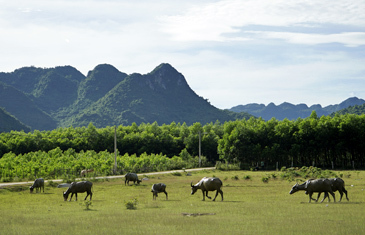 The return trip to Hanoi along the Black River passes traditional northern-style villages. After a full day’s drive to Phong Nha, we are rewarded with the bucolic setting of Chay Lap Farmstay surrounded by picturesque farming lands. The ‘Road 20’ section of the legendary Ho Chi Minh Highway cuts through some of Vietnam’s most beautiful landscapes. We reach Phong Nha-Ke Bang National Park, a UNESCO World Heritage Site renowned for its spectacular cave and grotto systems. A trek down to the forest brings us to Ban Doong, an authentic ethnic minority village and nearby entrance to Hang En Cave, the world’s third largest cave ‘Hang En’ translates as ‘Swift Cave,’ as thousands of Swift bird’s nest here. A short trek deep into this truly amazing cave system – which contains its’ own underground climate, river and jungle – leads us to our underground campsite. We trek out from Hang En Cave down to the river valley, before ascending a steep hill. Strapped into a safety harness, get ready for an 80m (262ft) steep descent into Son Doong Cave, the world’s largest cave and one of its most magnificent. Our three-day journey takes us through the cave system’s entire length, approximately 9km (5 mi) long and so massive, a Boeing B747 could fly through the largest cavern. Today, we undertake short climbs and bouldering and traversing underground rivers, encountering enroute the towering ‘Hand of Dog’ stalagmite and ancient fossils. Our overnight stay is a campsite set-up in a cavernous passage. Making our way to a second, extraordinary underground campsite, we head deeper into Son Doong Cave, encountering some challenging climbs but astonishing sights. 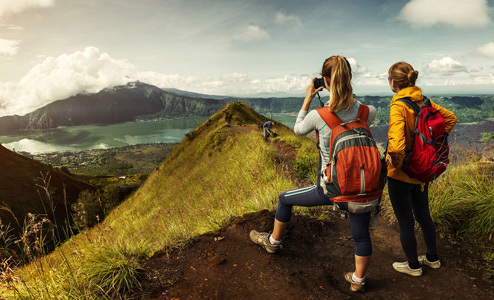 Highlights include treks through authentic underground jungles, and marvelling at cave pearls and gigantic rock formations, including some of the world’s tallest known stalagmites. The daunting ‘Great Wall of Vietnam’ – the only passage out of Son Doong Cave – is best ascended by ladders and ropes, before resurfacing back into dense jungle. Formerly known as Saigon, Ho Chi Minh City is Vietnam’s largest city and a dynamic, rapidly developing metropolis. We cycle through the city’s more rustic neighbourhoods, taking-in riverside markets, cottage industries and a traditional boat-maker’s village. Crossing the river on one of Saigon’s last remaining ferry crossings brings us to China Town (Cholon) Vietnam’s largest Chinese community, sprawled across an entire district and stamped with a unique Chinese ambience. A traditional medicine street and 18th century Thien Hau, one of Chinatown’s most important and exquisitely decorated pagodas, are two highlights. We leave the bustling metropolis behind for Cat Tien National Park, one of Vietnam’s greatest national parks, protecting one of the largest remaining areas of lowland tropical rainforests in the country. 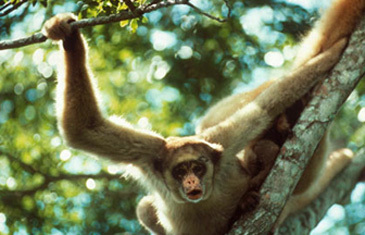 Accessing the park via the Dong Nai river ferry and after a short trek through dense rainforest, the Park’s inhabitant wildlife can be observed or heard; an experience repeated later with a nighttime excursion for nocturnal encounters. Another jungle trek reveals a myriad of bird varieties and Crocodile Lake, the natural habitat of the endangered Siamese crocodiles. We reach Kingfisher Ecolodge, in Ban Kiet Ngong Village, set amidst a stunning conservation area of lowland forest and wetlands, rich in biodiversity and backed by the Bolaven Plateau. This protected landscape is an unparalleled sight in Laos. A full-day guided trek takes us around Phou Asa Mountain for stunning vistas over large swathes of southern Laos, while rainforest trails yield archaeological ruins and endangered wildlife. Heading off from Don Daeng, a Mekong River island within a UNESCO World Heritage-listed ‘Cultural Landscape,’ a day of cycling through pastoral scenery can be enjoyed. Highlights include a guided tour of the pre-Angkorian Wat Phou Temple, a Khmer Hindu temple complex constructed between the 6th and 13th centuries and a UNESCO World Heritage Site. Our overnight stay is at rustic-style riverside lodge on Don Daeng Island. A full-day bicycle ride is the best way to explore parts of the Si Phan Don riverine archipelago – otherwise known as the ‘4,000 Islands’ – dotted along the Mekong River. A local ferry boat transports us across to Don Khong, the largest island in this magical riverine archipelago. Another ferry deposits us at the Don Kamao Islands, where locals are renowned for their fishing skills and noodle production – which you may get to try your hand at. 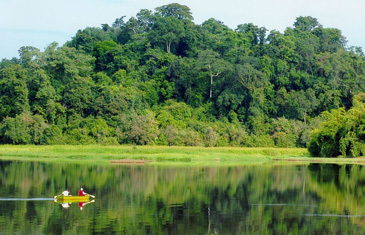 Spend the day kayaking among the Mekong River’s wondrous 4,000 islands. In this enchanting riverine setting, we paddle close to a French colonial-era railway bridge – the first railway in Laos – the Liphi Waterfalls, a natural border between Laos and Cambodia and freshwater dolphins. A local truck transports us to the raging Khone Phapheng Waterfalls, the largest waterfalls in Southeast Asia and one of Laos’ most impressive nature attractions. Transfer to Pakse Airport for your onward flight.